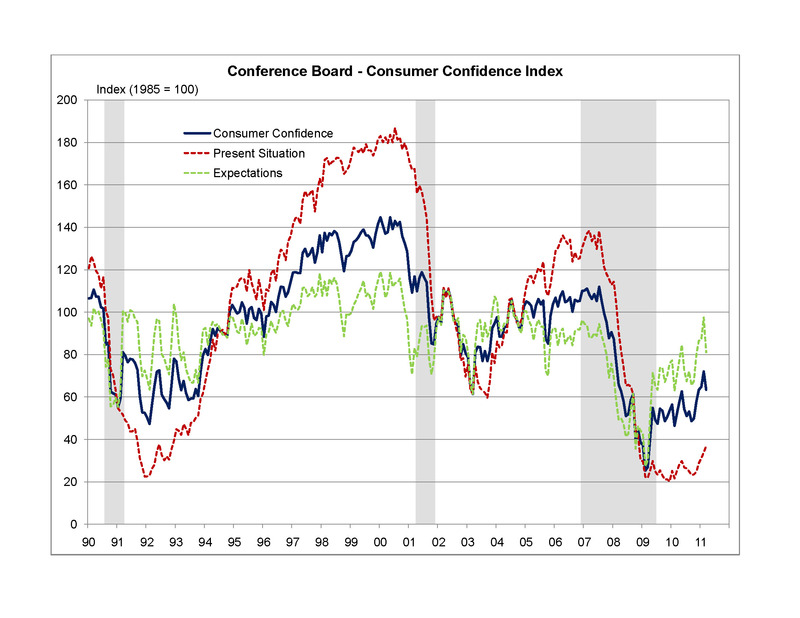 The Conference Board’s Consumer Confidence Index fell 12% in March to 63.4, with consumers’ outlook becoming increasingly pessimistic. The decline was driven by a marked decline in the Expectations Index, down 17% to 81.1. Consumers expect business conditions to weaken and the employment market to soften over the next six months. In addition, an increasing number of consumers anticipate their income will decrease over the next six months, while increasing energy and food prices have raised consumers’ inflation expectations. In combination, these factors are likely to impact on spending decisions and slow economic growth. Despite their gloomy outlook, consumer’s view of current conditions improved in March, with a 9% increase in the present situation in index to 36.9. Those identifying business conditions as “good” rose, but their appraisal of the employment market showed little change. The shift in the Conference Board’s Consumer Confidence Index parallels the results of University of Michigan Consumer Sentiment Survey, which experienced a 19% decline in its Expectations Index in March and a more moderate 5% decline in the Current Situation Index. Confidence in the housing sector dropped sharply in March, with the number of respondents indicating that they were planning to buy a home in the next six months falling to 3.8%, from 4.9% in February. A similar decline was observed in the number of respondents planning to buy a new home, down to 0.4% from 1% in February. This reflects the current depressed state of the housing market, with new home sales falling to a record low, a sharp decline in existing home sales in February and modest slippage house prices over the past three months.